Wellington, FL – February 4, 2013 – Top poker professionals, veteran players, and amateur supporters have all reserved seats for Poker Gives’ 2nd annual Cupids for Charity NL Tag Team Tourney at the Binion’s on February 17, 2013. The international children’s charity Step by Step Foundation will be one of the 5 beneficiaries for this year’s tournament at the popular casino at 128 Fremont Street in downtown Las Vegas, Nevada. Getting involved with Poker Gives is a natural for Stransky, who along with the help of Olympic show jumping veteran Margie Engle is planning her third “All In for Charity Poker Tournament.” They are looking to host the benefit tournament during this year’s Winter Equestrian Festival in Wellington, Florida. 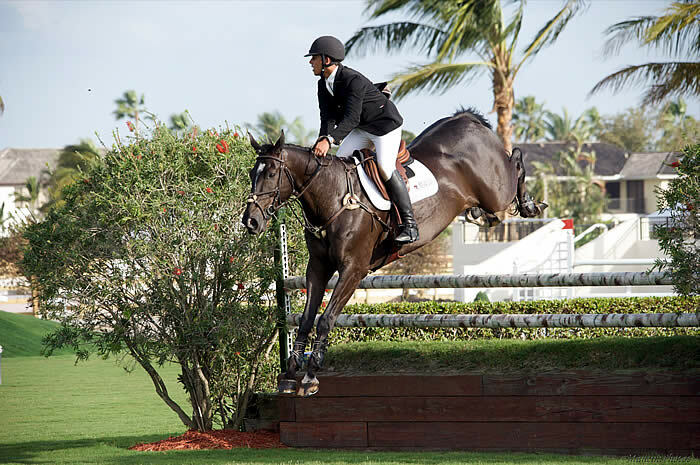 Wellington, FL – November 9, 2012 — Mario Gamboa piloted the grey gelding Unico to top honors during Equestrian Sport Productions (ESP) Fall Circuit at the Palm Beach International Equestrian Center in Wellington, Florida. The 19-year-old from Bogota, Colombia, was presented with the award for the Level 6 Jumper Championship for his efforts aboard the 11-year-old Dutch warmblood named Unico (Odermus R x High Hopes) on the final day of ESP’s Fall Finale Horse Show on November 4, 2012. While Gamboa may be a new face in the winner’s circle here in America, he is an established up and coming young talent and has represented his native Colombia internationally on numerous occasions, including as a member of the Gold Medal winning team at the 2010 South American Games and at the 2010 Youth Olympic Games in Singapore, where he was awarded the Individual Silver Medal. He is currently a Guest Rider for Liliane Stransky and is training under Hector Florentino at Stransky’s Mission Farm and Le Club Resort in Wellington, Florida where he has been proving his merit by winning top honors at top horse shows around the country. October 25, 2012 – Palm Beach County/Marion County, FL – Liliane Stransky, President and Founder of Step by Step Foundation, has partnered with Horses N Heroes to help raise funds for feed, bedding and other much needed supplies for the amazing ponies and horses at the Florida based children’s charity. Step by Step’s flexible funding campaign, which runs through December 6, 2012, will raise funds to help pay for the care of the animals in Citra in Marion County and also in Wellington in Palm Beach County, Florida. “I have a great team of riders who champion Step by Step’s efforts on behalf of others. They know first-hand the joy horses bring to others and they are working hard to help the horses and ponies that make the Heroes N Horses program possible. If something drastic is not done, Horses N Horses will have to close,” stated Stransky, who owns the show stable Stransky’s Mission Farm in Wellington, FL. Daniela Stransky pilots her mare Anemone's Vicky to one of only 3 clear rounds in the $10,000 Open Stakes. Mancini Photo. WELLINGTON, FL – October 15, 2012 – Daniela Stransky (15) may have been the youngest rider in the $10,000 Open Jumper Stakes at the ESP October Horse Show, but that didn’t stop the talented teen from being in the top of the class at the Palm Beach International Equestrian Center in Wellington, Florida. Aboard her chestnut mare Anemone’s Vicky, the Miami Country Day School student was one of only 3 clean rounds to advance to the jump. The first to go clean, she was also the first in the jump off where she put in a speedy, 4 fault round. Her effort secured her the 3rd place ribbon and $1,200 in prize money that she added to her ever-growing donations to the charity Step by Step Foundation (www.stepbystepfoundation.com). The class was won by seasoned veteran Sharon Wordley aboard Quick Blue Z, followed by Irishman Scott Keach riding Anne Quanbeck’s Coco to the second place ribbon. Parker, CO/Wellington, FL – August 5, 2012 – CEOs Liliane Stransky of Step by Step and Kyle Fenner of The Colorado Horse Park joined forces during the Summer in the Rockies horse show series to raise funds for the victims of the Waldo Canyon fire and charity helping, Colorado Springs Together. The event, held at the Colorado Horse Park in Parker, CO before the final $50,000 Parker Adventist Grand Prix, raised thousands for the displaced families in the community and their animals. In addition Stransky also introduced the Step by Step’s School in Backpack campaign, an online initiative which raised funds to buy supplies for students in the area before they go back to classes in the fall. This online outreach drew donations from around the country and, thanks to the success of both the Facebook and online promo, Stransky was able to purchase hundreds and hundreds of backpacks filled with much needed supplies which she and her staff sent out from the charity’s headquarters in Florida this week. Grand Prix veteran Hector Florentino was the first member of “team” of international riders who champion the Step by Step Foundation (www.stepbystepfoundation.com) in competition to put in fault-free and fast rounds at the Kentucky Spring Horse Shows. 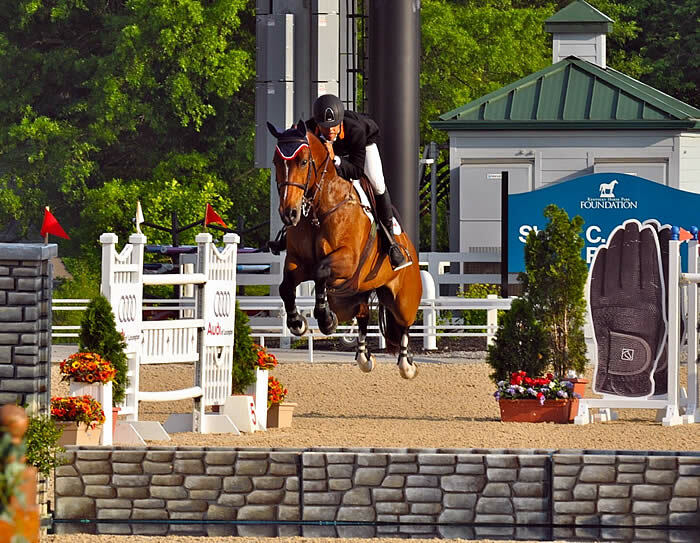 The talented Dominican Rider piloted Stransky’s Mission Farm’s Ultimo to the blue ribbon and trophy in the $35,000 Welcome Open on day one of the two weeks of competitions at the Kentucky Horse Park in Lexington, Kentucky in the beginning of May. 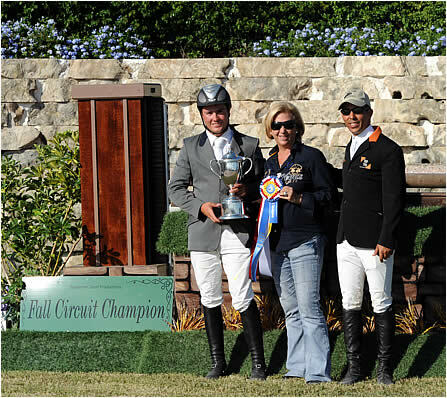 Wellington, Florida – April 9, 2012 – 15-year-old Emanuel Andrade of Venezuela, a junior ambassador for the Step by Step Foundation charity, dominated the competition at the 2012 FTI Consulting Winter Equestrian Festival held January 11 to April 1 in Wellington, FL. While winning classes he also raised awareness for the children’s charity Step by Step Foundation during each class! 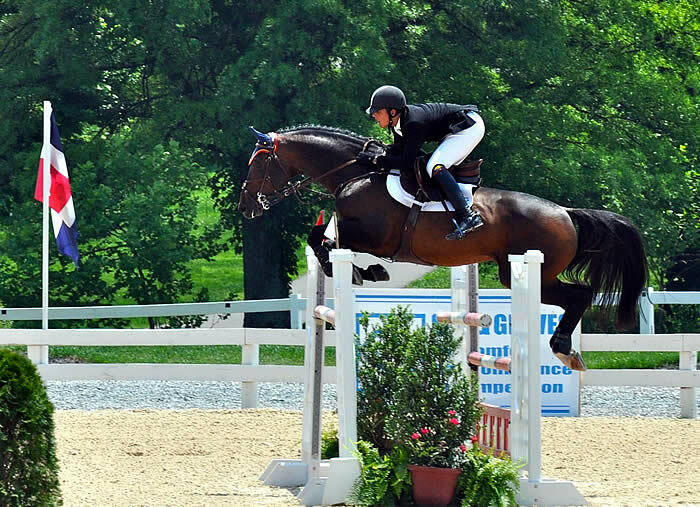 At the conclusion of the 12-week show jumping circuit, Andrade was presented as the Future Champions Leading Junior Jumper Rider, sponsored by Marley Goodman. Over the course of the competition, the teen who also champions the charity Step by Step Foundation in competition, claimed six Championship and 12 Reserve Championship titles. While 17 of those 18 titles were claimed in the Junior Jumper divisions, Andrade also earned the Six-Year-Old Young Jumper Horse Reserve Championship title during week 11 riding Black Pearl. Wellington, Florida – March 6, 2012 – Fifteen-year-old Emanuel Andrade, who champions the charity Step by Step Foundation in competition, continued to excel at the FTI Consulting Winter Equestrian Festival in Wellington, Florida, winning Low, Medium and High Junior Jumper classes all on the same day. On Friday, March 2, Andrade topped a field of 58 entries to win the Low Junior Jumper class with Casanova Junior, claimed victory in the Medium Junior Jumper class with Oxford, and won the High Junior Jumper class with Tiny Tim. At the end of week eight, Andrade rode away with the Medium Junior Jumper Championship title with Oxford and the Reserve Championship title with Mississippi L.S. He also claimed the Reserve Championship title in the Low Junior Jumper division with Casanova Junior, a 13-year-old Oldenburg gelding. 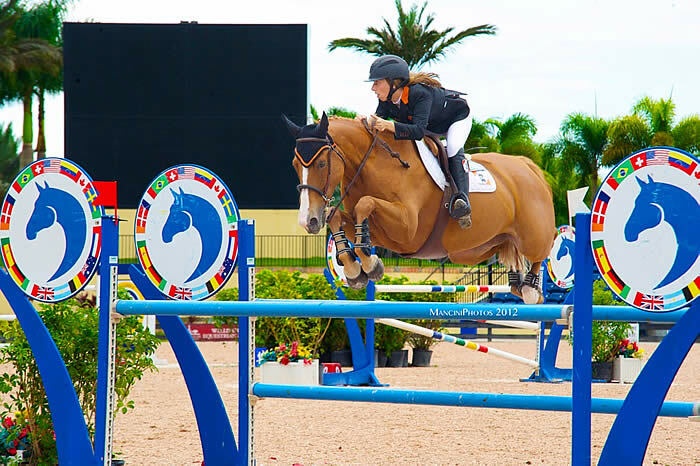 Wellington, Florida – 15-year-old Emanuel Andrade was presented as the Future Champions Leading Junior Jumper Rider on Saturday, February 25, at the FTI Consulting Winter Equestrian Festival in Wellington, Florida. The teen, who hails from Caracas, Venezuela and who has his stables and family home in Palm Beach County regularly champions the charity Step by Step Foundation in competition in show jumping competitions. He has been consistently winning in the Junior Jumper division and placing in Grand Prix competitions against some of the top international riders in the world at the Palm Beach International Equestrian Center this year. In a special presentation held during Saturday evening’s $100,000 CSI3* Fidelity Investments Grand Prix, Andrade was recognized in the International Arena as the Future Champions Leading Junior Jumper Rider, sponsored by Marley Goodman. Emanuel Andrade makes Grand Prix debut, by Jack Mancini, Mancini Photos. 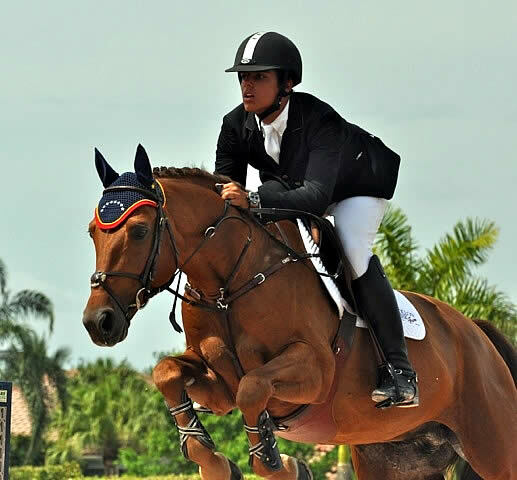 Emanuel Andrade (15) made his debut in the Open Jumper arena in the $25,000 A-T Children’s Benefit Grand Prix at the Palm Beach International Equestrian Center in Wellington, Florida at onset of 2012. The teen, who champions the children’s charity Step by Step Foundation (www.stepbystepfoundation.com), faced off against stiff competition from a field of top international riders, including Olympic veterans and Debbie Stephens, Pablo Barrios and Step By Step Advisory Board member Margie Engle. Andrade rode two horses, Oxford and La Fe Florli, in the class. After the 45 rounds had been completed, Andrade took the 11th place with La Fe Florli and the class was won by Catherine Pasmore aboard Van David. 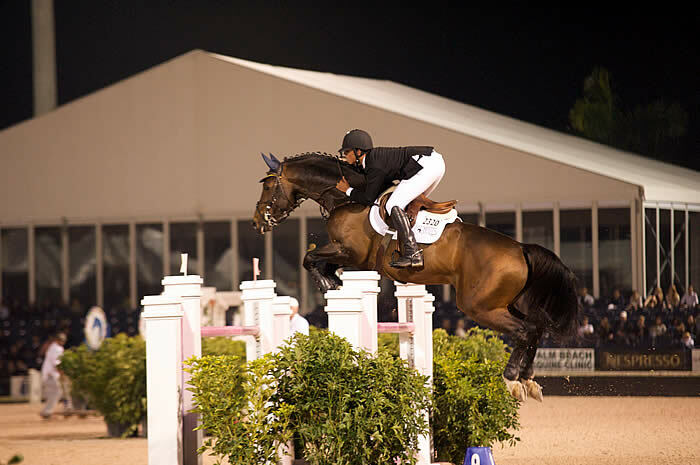 The second place ribbon went to veteran Andrew Bournes and third place went to iconic Olympic rider Rodrigo Pessoa. 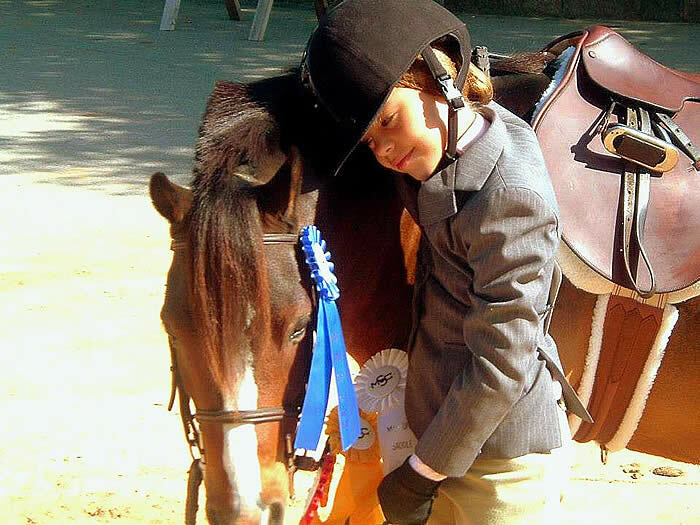 The formidable young equestrian took the Championship in the Junior Jumpers Low division riding P.S. I Love You and placed second in the Junior Jumper Highs on Luky Des Roquelines the same week.